I cant tell you how many times I have heard the words " You are such a Martha Stewart" (haha) I just love crafting, diy, painting, sewing, and home decorating. It gives me great satisfaction to look around my house and say " I MADE THAT!" Ok Ladies, I finally put together a tutorial! I have had so many of you ask me to do one, but between our family pictures and vacation last week I just didn't have time to post. Well here it is the Rag Doll Tutorial. Here is my pattern, it is very simple. 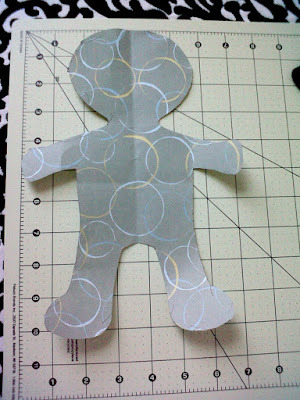 Next I folded my skin colored fabric in half and traced my doll pattern. I like to save time by cutting both sides out together. I left about a 1/2 inch seam allowance, I did a zig zag stitch right over my traced line. I left a 2 1/2 in. 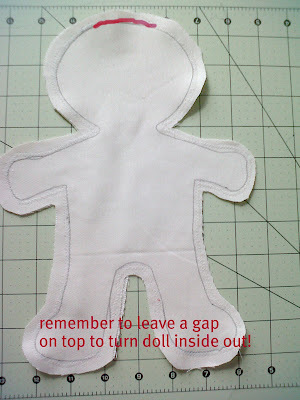 to 3 in gap at the top of the head to turn it inside out, like a pillow. Once it is inside out you can start stuffing! I like to stuff the feet and arms first then continue from there. 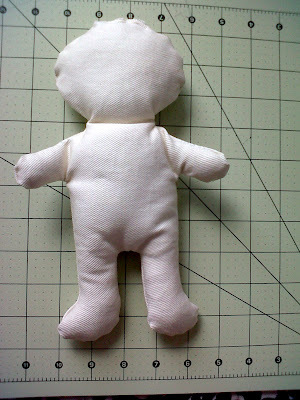 Once you are happy with how full and plush the doll is you just sew the top shut. 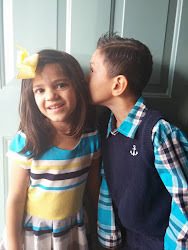 Trim the excess and your little guy or girl is ready for hair!!! 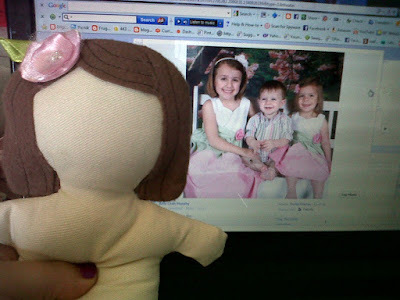 Here is my favorite part, customizing it to look just like your little cutie! I used felt for the hair since it doesn't fray! I also stitched hair strands in a dark color to add a little more interest. Sew the hair like a hat with a seam running down the sides of the head. turn inside out and hot glue it to the top of the head. I also like to put a few stitches it, just so I know it isn't going anywhere. 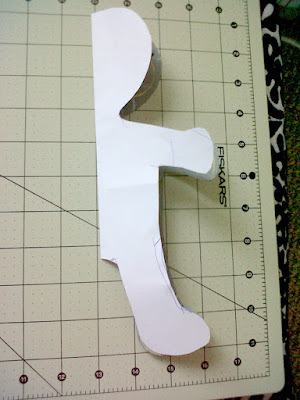 To make this hair style I started with cutting out the shape of the hair sewing around the top and side edges. Next I turned it inside out and cut out the face opening and bangs. I wish I would of took pictures of this process, but I was doing a different hair style for each doll, so I didn't make any patterns. It is all about details and the amount of time you are willing to spend on these dolls. 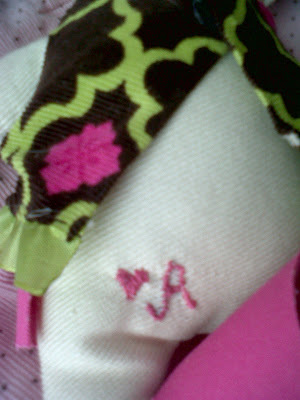 I even added a little A to the backside of Abigail's doll. Just little things like that make them even more special! I hope you enjoy using this pattern and remember to HAVE FUN WITH IT!!! These are adorable! Thank you for the tutorial! Those dolls are awesome! This is a tutorial I most definitely will try. 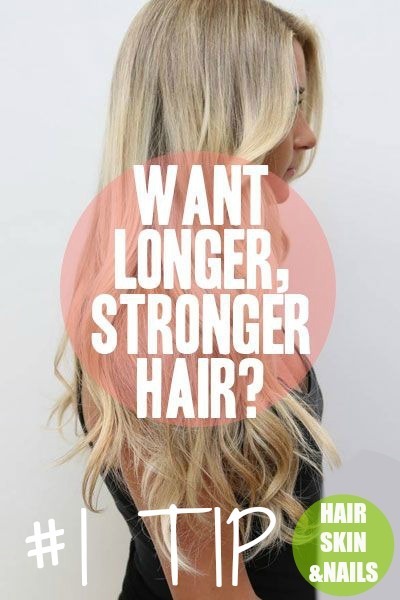 It sounds easy enough and the results are so cute! I have a two year old daughter who would be just thrilled if I made her one! Thanks! I LOVE IT! Definitely going to use this tutorial. I am also one of your newest followers! Wow, amazing job! Super cute dolls, I'm pinning this to try myself one day. 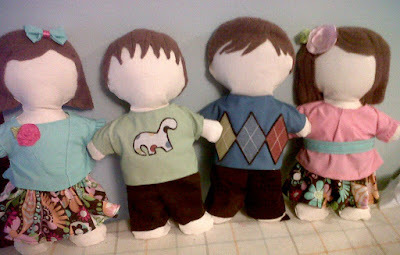 Your dolls are so cute and you did an amazing job customizing them! I'm new to your blog : ) stop by and visit sometime soon! Thanks for sharing, the dolls are great! This is a GREAT idea and tutorial! Thanks. So stinking adorable!! I've been trying to figure this out for months. Thank you. Darling little rag dolls! My girls would love them! So glad you linked up with us at Show & Share! I love it! What fun cuddly dolls! Fabulous!! Thank you so much. Perfect for Christmas. This is supercute! I have to try it one time! thanks for the tutorial! i love rag dolls...looks so dang cute! 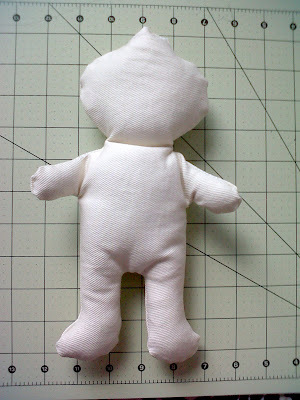 Can't wait to make a sweet little doll! Thanks for sharing and great tutorial! These are very cute dolls. What do they look like from the back? How is the hair attached? I think I may have missed something in the explanation. So sorry I didn't get very good picutres of the hair being add on. I used hot glue to keep it in place, then I just placed a few stitches around the head to make sure it wasn't going anywhere. I made my hair like a hat, so the back of the head is completely covered. I didn't even think of taking pictures from the back! I will have to remember that when I make my next one. :) Hope this helps. Glad you asked! I was wondering about the hair also! Love this! 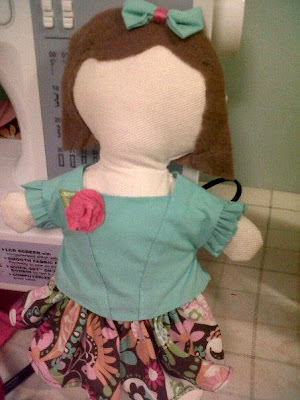 I'm new to sewing and fabrics, what type of material did you use for the doll's body? I'm having a hard time visualizing the hair process. Any pointers on that step for me? I want to try this out but just can't get past how to do the hair. <3 <3 <3 that there are little boy dolls! 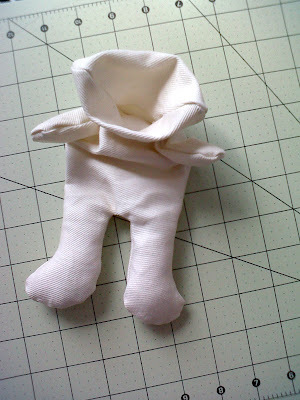 I am trying to make a doll for my daughter and this is maybe the best way to do it. I need to go do this doll. My daughter will love it. she will play with it. she likes to stay under a table with a blanket over top of it but this will really keep her out. She will love this. Thanks for posting this. Do you have an actual pattern for this doll? 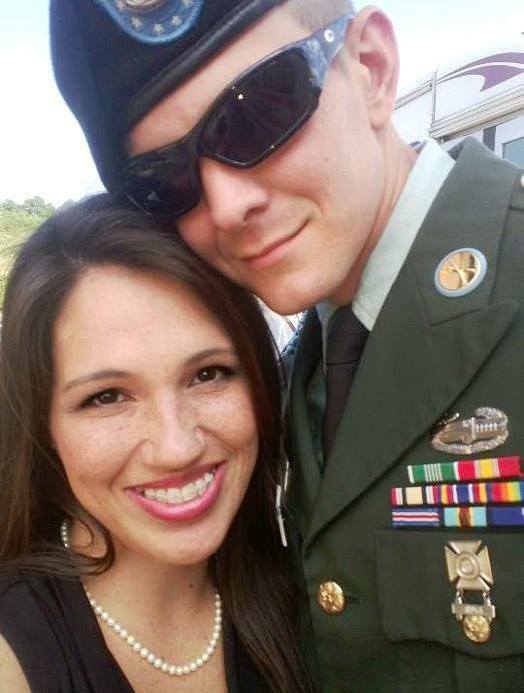 I want to make some and give to a friend to donate to the hospital where she gave birth to her beautiful daughter that died at birth. This is really cute - do you sell the pattern? Just love the cute little dolls. I am hoping to make some for little girls around the world. Thank you for this. I'm going to do it but will have to modify a little and have the parts removable for therapy identification. If you insert a squeaky toy or two in the body of the doll (and make the stuffing non-toxic, even rags) you have a perfect toy for your doggie. Wow! Adorable and cute little dolls, thank you very much for this tutorial. 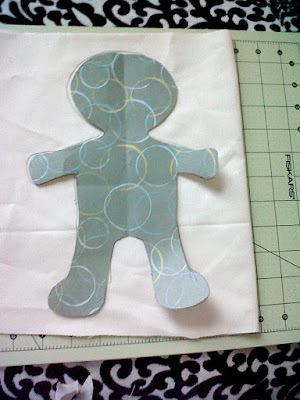 I am making this doll tonight :) Your pattern is simple and easy, also excellent !!! I'm so happy to have found your post. 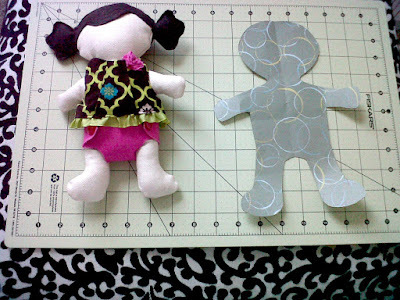 I've been looking for a doll pattern to make some for the Samaritan's Purse at Christmas time. Thanks again! Hello! My name is Jeni, I am 27 yrs. old. I have 3 great loves in my life... My wonderful husband Greg, my handsome little man Cole, and my sweet and sassy baby girl Abigail Grace! 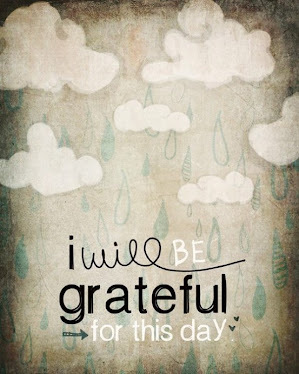 I have been so blessed beyond all measure, so undeserving of HIS love for me! May God be glorified in me as I strive to be the best Mother, Wife, and Child. 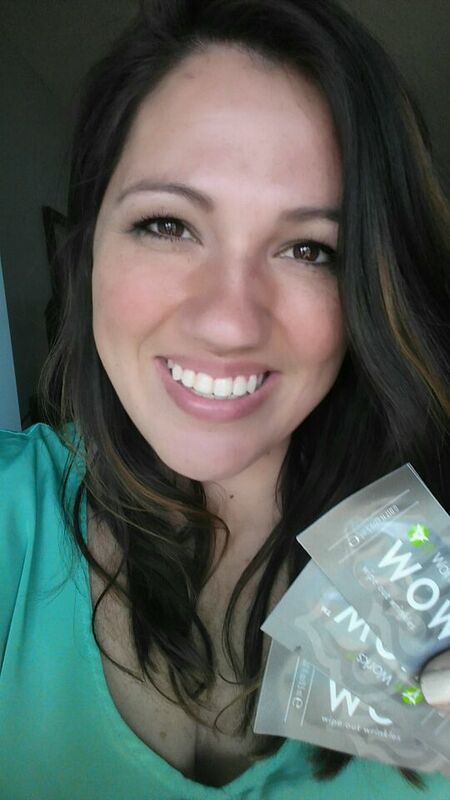 I am a It Works "It Girl" I love this company and the financial freedom it has given my family! 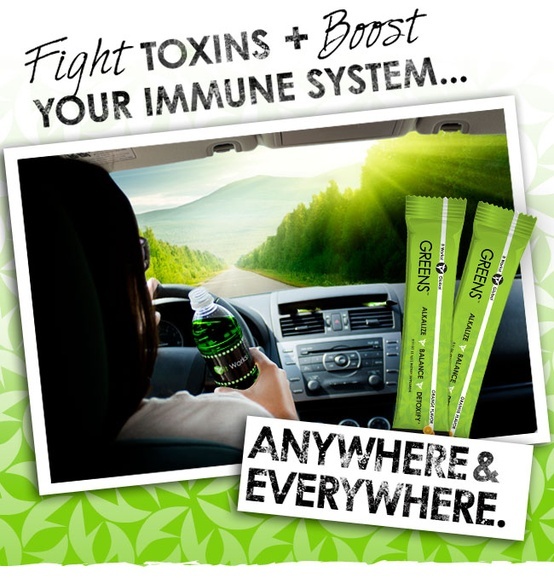 The All Natural Product line is AWESOME!!! 4 wraps over 2 weeks Helped me get rid of my MommyPooch! Hair Skin and Nails is no JOKE! I am amazed at the difference in my HAIR!! !